Gaskets are frequently used in outdoor enclosures and potentially exposed to sunlight. 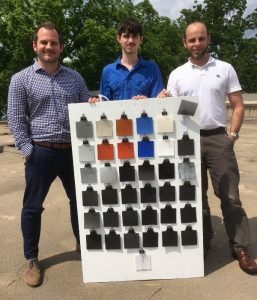 So we wanted to run an experiment with side-by-side testing of a variety of materials including: SBR (styrene-butadiene rubber), neoprene (polychloroprene), EPDM (ethylene propylene di-monomer), ECH (epichlorohydrin), PORON® microcellular urethane foam, silicone foam, silicone sponge, solid silicone and fluorosilicone. 37 samples of various gasket materials mounted and tagged on a board that was placed on the roof of our facility. We will be checking these during the summer for the effects of sunlight aging, which may show up as surface cracking, shrinking or discoloration. We also retained control samples of each material for comparison. Our summer intern, Marc Ebiri, will be helping with the evaluation of the samples on the weather aging board, along with gasket immersion testing and other projects. We think silicone rubber will outperform the other categories. Look for a follow-up blog post here after the experiment is finished.